a line in 3D space between 2 vertices.Note: A line between 2 vertices is always straight. 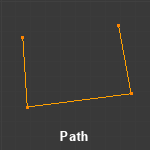 You might be tempted to think that Blender also supports bended lines. 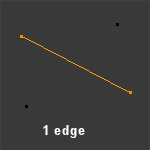 For example when you use a Subdivision modifier then the lines between two visible vertices look like they are bended. 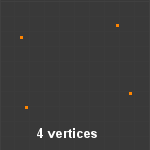 But this is because the modifier actually subdivides the edges by adding more vertices. a series of connected edges.Note: Pathes are always straight and have no junctions and no crossings. a path where the start-point and the endpoint are connected. The vertex where two (or more) edges connect. A plane figure that is bounded by a Closed path. 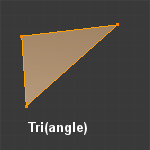 Short for Triangle, a Face defined by a closed path with 3 connected Edges.Note: Tris are the only Polygons which always are absolute planar. Short for Quadrilateral, a Face defined by a closed path with 4 connected edges. Note: Quads are not necessarily planar! Quads can always be constructed from 2 Tris. But take care! the construction can always be done in 2 ways and the results look different! See also the video I love Quads. 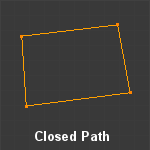 A Face defined by a closed path with n connected edges. N-Gons can be constructed from n-2 Tris.Note: N-gons are supported by Blender since Release 2.63. Map which relates the faces of the mesh to areas on a 2-dimensional image.Important: The UV-Map is not(!) the image, but a list of face-pairs. The grid lines shown in the UV image editor are a visual representation of the UV map. 2-dimensional image for storing texture information for one surface of an object.Note: “Surface” is a synonym for “Face” in SL-notation. Part of a Mesh associated to one single Surface-Texture. (equivalent to “Face” in “SL-notation”)Note: For Meshes a Surface does not necessarily need to be a contiguous area of faces. A 3D-representation of a primitive as a set of Polygons and optional up to 8 Surface-Textures. Mesh with a fixed UV-map and an associated Sculpt-Map for baking, and optional one additional Surface-Texture. procedural Mesh defined (generated) by use of “Prim Parameters” (equivalent to SL-Primitives) and optional up to 6 additional Surface-Textures. 2 dimensional image for storing vertex locations of a sculptie (used with UV-Map). any Object in the Blender scene. UV Map for baking the Sculptie’s location information. UV Map for the Sculptie’s Surface-Texture.Note: a primitive can have more than one UVMap. 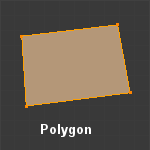 The additional ones are by default named UVMap.001, UVMap.002, but UV Maps can be renamed as you like.